On the island of Kwajalein in the South Pacific, the Air Force has hired Lockheed Martin to build a billion-dollar facility projecting a huge radar wedge 1,800 miles into space to find orbiting debris. And those are just the ones we know about. Scientists estimate there are hundreds of thousands of undetected objects in space resulting from collisions such as that one, and from the deterioration of old rocket boosters, dead satellites, and other stray hardware. That is the reason behind a squat, white structure that opened this year near Route 38 in Moorestown, at the South Jersey campus of Lockheed Martin Corp. Inside are transmitters that project an invisible curtain of radar beams into space, recording each time an object passes through. 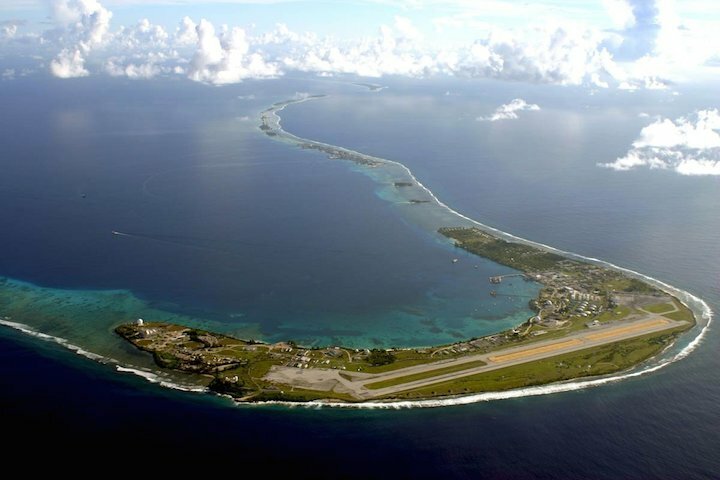 It is a test site for a much larger, billion-dollar system that the Air Force has hired Lockheed to build in the South Pacific, on the remote island of Kwajalein. That site is expected to be fully operational by the end of 2018, but based on early detection results from the Moorestown location, the Air Force already is pleased. Dana Whalley, the agency's program manager, said the new system will represent a huge upgrade from the previous version, a decades-old network of radar transmitters scattered around the world. The old system was designed to track ballistic missiles, and was blind to many thousands of pebble- and golf-ball-sized fragments circling the globe. Whalley likened the old radar network to shining a series of flashlights in the attic. But the new system? "We're going to turn on the light in the whole attic," he said. Pebble-sized objects may not sound like much of a threat, but typically they travel at thousands of miles per hour, posing a risk to satellites that are essential to the daily workings of modern society, such as communications, weather forecasting, and GPS location. The radar emitted from the South Pacific location will take the form of a wedge-shaped fan, jutting out at right angles from the Earth just above the equator, said Lockheed program manager Bruce Schafhauser. The invisible wedge will be roughly the size of the continental United States - sticking out about 1,800 miles into space, measuring about 3,000 miles across at its widest point. The radar curtain emitted from the Moorestown site is perhaps one-third the size, and far less sensitive, equipped with just 3 percent of the transmitters and receivers to be installed in the final version. But Schafhauser said it has proved invaluable in helping Lockheed, which is based in Bethesda, Md., to work out any kinks before undertaking construction in the South Pacific. During a tour of the South Jersey facility last month, he and colleague Bruce Fredericks showed off a 9-foot-square radar module crammed with electronics and black tubes of coolant snaking down from the ceiling. Dozens of such modules are to be installed in the South Pacific site; each can be shut down for repairs as needed while the rest of the units keep the system running, said Fredericks, Lockheed's radar program manager. "It's a building-block approach," he said. David B. Spencer, a professor of aerospace engineering at Pennsylvania State University, said the Air Force oversees the program because it was tasked with the original mission of tracking ballistic missiles, though the agency works closely with NASA in keeping an eye on space. "It's a sound approach they are taking," Spencer said of the new Lockheed-designed system. The radar curtain, which Lockheed has dubbed the Space Fence, will not be continuous, said David Finkleman, chief engineer at SkySentry, a Falcon, Colo., company that performs mission, operations, and design analysis for satellites and airships. The array of radar beams rapidly "paints" the detection curtain over and over again, meaning that a given object could theoretically leak through the curtain, undetected, on any one orbit, he said. Lockheed's Schafhauser agreed but said the design will achieve 99 percent detection for any given orbit of an object, well above the 95 percent required by the Air Force. And if an object is missed on one pass? "The few that sneak through will be picked up with a high probability on the next pass," Schafhauser said. In addition to detecting objects, the system's computers also calculate their orbits, in order to forecast collisions such as the one in 2009, between a U.S. Iridium communications satellite and a defunct Soviet-era satellite. Or like the unknown particle that ripped a 16-inch hole in the solar panel of a European satellite Aug. 23, causing a small loss in power. But if engineers can tell when a collision is coming, then what? The easiest approach is to steer a satellite or change its altitude to avoid collision, said Penn State's Spencer. In the event such maneuvers are not possible, others have proposed the use of lasers or other means to move the debris, he said. Lockheed's primary 3,000-mile radar wedge is designed to span the crowded region called low-earth orbit, home to many satellites and the International Space Station. On a case-by-case basis, the radar system also can be directed to detect objects out to tens of thousands of miles from Earth. National defense will continue to be part of the mission, said the Air Force's Whalley. "It's not just debris," he said. "What are our adversaries doing in space? Where are they putting their assets?" Using its old surveillance network, the Air Force was able to identify about 20,000 objects in space, including satellites and debris. Lockheed officials estimate that the new system, housed on a speck of land in the South Pacific, may detect 10 times that many. But until those new eyes on the sky are activated, no one really knows.